Eric travels all over the world, teaching, recording, and picking up new dance moves and styles wherever he goes. This has been rated as one of the most “Move-Packed” DVDs in the World. Learn to dance on any beat of the music, so you’ll be prepared to dance with anyone, anywhere! Salsaville’s latest DVD offers an instructional “Grande Tour” of the world’s four dominant styles of salsa dancing. Did you know that salsa has become the most ubiquitous and international social dance in the world? You can now travel to just about any medium-sized city, anywhere on the globe, and find a salsa club! But dancers beware: salsa is not danced exactly the same everywhere you go! This Three-Hour Long instructional DVD was designed for those who want to know it all. It takes you on a ‘Grande Tour du Monde’ of all of the four major styles of salsa dancing: New York, Los Angeles, Cumbia, and Cuban (a.k.a. “Casino”). Internationally recognized salsa masters Eric Freeman and Edie, The Salsa FREAK!! will not only teach you how to immediately recognize and distinguish these four styles, they will also teach you how to become a complete salsa dancer, so that you can adapt your style to suit that of your environment – wherever in the world you happen to be. It all starts with the rhythm. Have you ever wondered what it means to dance salsa “on 1” or “on 2”? Did you know that there are two distinct ways of dancing “on 2”? And did you realize that you can also dance salsa “on 3”? Eric and Edie will explain all of this. 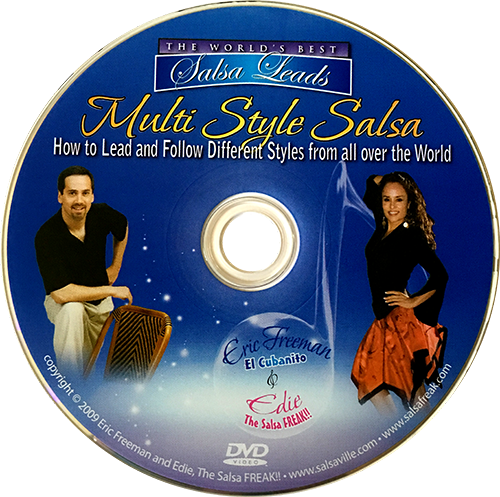 From then on, the DVD focuses on each style of salsa. For leaders – how to modify your timing, mechanics, and move repertoire accordingly. For followers – how to develop the flexibility to dance with any good lead and thus greatly improve the chance of being asked for that second dance. As an added bonus, the last hour of this DVD features a series of informative open discussions, in which salsa masters Eric and Edie debate some of the most controversial aspects of the 50-year development of the salsa dance “sub-culture.” They pull no punches as they eat and laugh their way through an impromptu exchange of thoughts, ideas, and opinions. Made mostly for people who are already comfortable dancing some salsa, this video will enable you to walk into any salsa club, anywhere in the world, with the confidence that you will not only survive, but even have a great time. ““When in Rome, do as the Romans do; when in Cuba, do as the Cubans do” says Edie the Salsa Freak in this DVD. Makes sense, but what do the Romans and the Cubans do? And how? You would not expect Edie to give a cryptic suggestion without a full explanation and indeed in this DVD Eric and Edie give you full details on how to behave and what to expect, salsa-wise, wherever you may go, anywhere the world. It is hard to imagine a couple better suited for the task, both being very experienced and well travelled (literally). From the dance floor experience of these travels they reconstruct for us an atlas for today’s salsa, which you can consult wherever you plan to travel, whether to LA, Colombia or the salsa club down the road where they dance that strange salsa style, the one you are not familiar with. The atlas is divided into four continents: NY style, LA style, Cuban Style and Cumbia Style, and within each continent some local variations are also mapped: a fully self-contained handbook on all you ever wanted to know about salsa styles. Salsa styles differ in terms of some typical turn patterns as well as timing, style and the relationship between the dancers. Eric and Edie are too wise to fall into the trap of teaching turn patterns so they go straight into what really counts: the difference in the lead, in the following, in the hand hold, in the direction of the dance, in the footwork, in the timing and in the music. Their teaching is not only technical, it also covers the human and social aspects of the dance: the local habits, the idiosyncrasies of the different styles and what you may need to expect if you enter a club were a particular style is danced. You must know a minimum of salsa to make the most of it, since the features of the various styles are covered with the expectation that you know basic steps, cross body leads and similar elements. Given that, I believe anyone can benefit from this DVD. 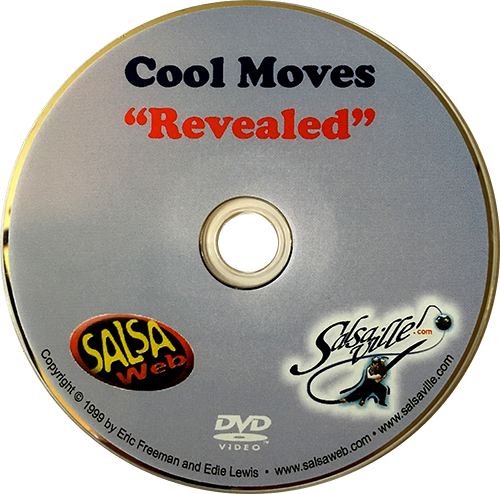 For beginner dancers, this DVD can be a Pandora’s box of surprises, anticipating the variety of adventures awaiting your coming 1001 salsa nights. For intermediate dancers, it may clarify things perceived via word of mouth or via the occasional experience with a visiting salsa dancer. For the advanced dancers, this DVD will make you appreciate styles until now disregarded. This is probably the most important message of the DVD: every language has beautiful expressions.. don’t be limited by local salsa slang. Finally, for the well travelled who have danced everything and everywhere, this DVD can be a useful reminder of details once known and now forgotten, an excellent summary conveniently put together. Because of all these reasons, this is not a DVD to devour quickly, but rather the equivalent of a reference book, something you keep on your bookshelf and which you may want to refer to several times in the years to come. Keep in mind that this is part of Edie’s ‘Best Lead’ series and Eric exhibits superb skills not only at leading Edie impromptu into difficult passages but also in explaining clearly how he does it; knowing how to lead well and explaining how to do it are not the same thing and excelling at both is a rare gift. Surely having a world renowned follower helps and the hints from the lady’s side are just as valuable. Why such a DVD? Because probably the one and only success story of globalisation is salsa and while until a few years ago you were compelled to learn the only style the local community could offer, today in most large cities you can choose and it may happen that you enter a club where your favourite style is off-limits and you don’t want to risk missing the fun. Today, speaking several salsa languages is a must and this DVD represents a handy phrase-book.